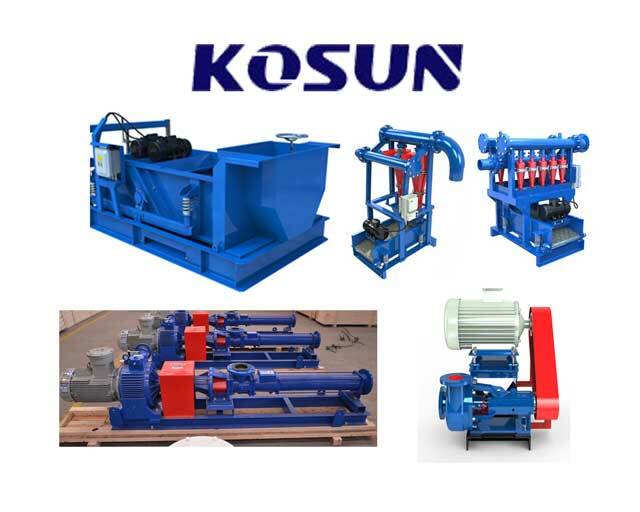 Shaft sinking machines separation units，also can be called by Kosun Shaft Sinking Machines separation plants or Shaft Sinking Machines separation stations, is refered to the slurry separation or mud cleaning machine system in shaft sinking progress. Shaft Sinking Machines separation units have several components, and they are: Shale shakers, Desanders, Desilters, Mud tank, Mud pump(or screw pump), and electric control panel and other accessories. Shake shakers are the first group of equipment used in the system. They help to remove huge cuttings or solids from the mud or drilling fluids. These are types of mud separators used not only in the oil industry but in mining, and coal cleaning industry. The shale shakers are the basic separation tool found on the rig. When the drilling fluids get to the surface, they are passed into the shale shakers for onward processing. Many people in the drilling industry would refer to them as the most important equipment in the industry, so as the shaft sinking projections. There are two types of shale shakers, the primary and the secondary. The primary shale shaker make use of coarse screens to remove larger cuttings while the secondary shakers uses fine screens to separate smaller cuttings. When you bring the functionality of desanders and desilters in one, what you have is the mud cleaner because they function to remove the drilled cuttings from the mud. There are yet many other types of the mud separation systems, including desilters, desanders,mud agitator, mud guns and mud pumps. And maybe another type of machines can be used(but not often), mud gas separator,This system is often referred to as the gas buster. It engulfs large amounts of free gas within the fluid in the drilling channel. The process it goes simply by introducing the mixture of mud and gas into the system. With impacts with a series of baffles installed, the mixture is then separated accordingly. There are three types of the mud gas separator. They are :Open bottom type,Closed bottom type and Float bottom type. In one word, the Separation units in shaft sinking machines used projects are important and should be pay more attention.